He has certainly been busy, creating a series of exciting and beautiful designs for very varied audiences. The gallery below uses the pictures in his newsletter, reproduced here with permission. I am also cribbing his text for the descriptions. The History Tree is a collaborative public art project with Anne Schwegmann-Fielding for Kent’s new central library & archive. Rising up the library wall is a polished stainless steel sapling, sculpted to depict life through all seasons. LED lighting illuminates the artwork at night, with strands of colour leading up the trunk of the sculpture. Work is now under way on the paved “shadow” tree, extending across the paving at the foot of the wall artwork. Its leaves are engraved metal, with text and images to reflect the history of Kent and the thoughts and memories of its people. These stories were gathered through a programme of art workshops across the County. Participants drew, wrote, etched and sculpted their experiences of Kent in a variety of media. As part of the History Tree project Michael has created a flurry of mosaic leaves to set along the frontage with gorgeous coloured glass mosaic. A way-marking scheme is to follow, with leaf trails along pedestrian routes to the new library. He was commissioned to make a sculpture for a Civil War heritage site in Newark. The “Queen’s Sconce” is a large 18th century cannon emplacement earthwork set up by the royalist defenders of Newark. Usually, these things were destroyed by the victors, but thanks to a bout of plague at that time, the attacking forces moved on sharpish. So Newark has one of the best surviving examples of this structure in the UK. After consulting with Newark’s museum services and local residents, he developed a design and created the Royalist Cannon. The surface of the artwork is a decorative design using images and phrases from the Royalist side. Heraldic emblems from King Charles I’s and Newark’s town crests are combined and woven together to form the surface detail. He was also asked to create artwork for the new footbridge that links the monument to the “mainland”. In the design a chained portcullis representing the Parliamentarians flows towards the centre of the bridge, meeting strands of fleurs-de-lis, ermine and other imagery from Charles I’s coat of arms at the “sconce” end. The curve of the bridge is based on the trajectory of a cannonball. Molecular is a commission for King’s College Hospital in London. Each sphere in Molecular is made up of a variety of figures supporting each other. 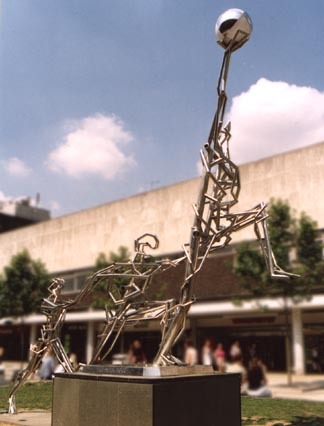 This artwork was developed with Acrylicize, a design company he worked with on his Braintree Hospital sculpture. Finally, he created a piece for Standlake primary school in Oxfordshire. The children made drawings for their new Peace Garden and the sculpture incorporates their ideas in its surface detail.